Version 3.0.0 is available now! The latest version of the UAT has been released! Version 3.0.0 brings many changes and updates to the Unified Astronomy Thesaurus. We heavily reworked the “Stellar astronomy” and “Solar physics” branches to reflect feedback from the community. The organizational structure of the “Stellar types” section has proved challenging since the beginning of this project. There are now multiple ways of approaching and organizing the stars, which reflect the myriad ways astronomers think about the topic. Nearly 40 concepts were added to the “Solar physics” section, which was also renamed from “Solar astronomy.” Besides adding concepts that describe new topics, we updated many concepts to differentiate between the Sun and the stars more generally. Another branch that received heavy revision is “Computational astronomy”, as it holds the new sections on “Astronomy software,” “Computational methods,” and “Astronomy data analysis.” Similarly, we added a new branch in the UAT for “Astrostatistics,” which covers common tools and techniques in that field. We added these branches to reflect the importance of software, programming, and computational resources in modern day astronomy. The last major addition to this version of the UAT comes in the “Laboratory astrophysics” branch, which deals with the study of atoms, molecules, plasmas, particles, dust, and ice in the lab. Research conducted in the lab and theories about these fundamental topics inform astronomers and help them to understand the physical processes that they observer throughout the universe. We also made many smaller updates and changes, in total adding 258 new concepts to the UAT. 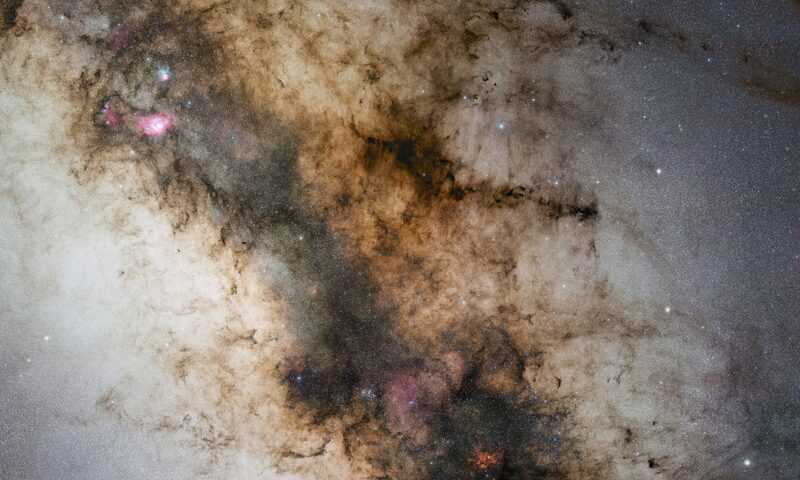 242 new “related concept” links were added throughout the UAT, many of which increased the connections between solar and stellar concepts, and between concepts about the Milky Way galaxy and concepts about other galaxies. Many specific stellar classes (i.e. T Tauri stars, or ZZ Ceti stars) were re-evaluated and moved to more relevant subsections of the UAT. Many duplicate concepts were identified and merged. We made updates and additions to the Alternate labels for over 190 concepts to help increase findability, as well as adding 15 scope notes and 8 definitions to increase clarity. Finally, we deprecated 51 concepts, mostly due to duplication or low usage in the literature, streamlining sections of the UAT. The UAT Steering Committee would like to thank the many people who reviewed and contributed the feedback, including Jason Barnes (University of Idaho), Nancy Brickhouse (Harvard-Smithsonian Center for Astrophysics), Adam Burgasser (UC San Diego), Ed DeLuca (Harvard-Smithsonian Center for Astrophysics), Eric Feigelson (AAS Editor, Penn State University), Leon Golub (AAS Editor, Harvard-Smithsonian Center for Astrophysics), Iouli Gordon (Harvard-Smithsonian Center for Astrophysics), Chris Lintott (AAS Editor, University of Oxford), Aimee Norton (AAS Editor, Stanford University), Jenny Novacescu (Space Telescope Science Institute), Radek Poleski (Ohio State University), Thomas Robitaille (AAS Editor, Astropy), Daniel Savin (AAS Editor, Columbia University), Sarah Weissman (Space Telescope Science Institute), and Henry “Trae” Winter (Harvard-Smithsonian Center for Astrophysics), among many others. The UAT Steering Committee would also like to thank Kelsey Gibson, Katie Jones, and Jaihyun Park for their work building crosswalks between previous thesauri efforts and the UAT. Version 3.0.0 of the Unified Astronomy Thesaurus consists of a polyhierarchy with 2050 concepts, 11 top concepts, a depth of 11 levels, with 534 related concept links. 258 new concepts were added to the UAT. The preferred label of 88 concepts were updated to add context, clarity, and consistency. Added or updated AltLabels for 196 concepts, remove AltLabels for 34 concepts. Added 8 definitions, 15 scope notes, and 1 example. Removed 20 related links, added 242 new related links. Resolves Issues in Milestone Baerlon, Milestone Stellar types reorganization, and Milestone Solar physics updates. The UAT is available for download on GitHub. For a detailed list of changes, see the full release notes. The UAT is an open source project supported by the AAS. Although the website has been pretty quite, a LOT of work has gone into the UAT since I last posted an update nearly one year ago. This is a short summary update of the status of the UAT project; expect more details to follow. A few weeks ago we published version 1.1.0 to Research Vocabularies Australia (RVA), a controlled vocabulary discovery service from the Australian National Data Service (ANDS). We’ve been collaborating with ANDS for the better part of 2016 and are happy to have the UAT publicly available on their platform. From the RVA platform, you can download the full UAT in different file formats, or use the API function to connect the UAT to your applications and websites. Julie Steffen, Director of Publishing for the American Astronomical Society, has formed a Steering Committee to manage the operation and direction of the UAT. The Committee meets regularly, about once a month, to discuss topics such as outreach, funding, development, and licensing. Alberto Accomazzi (SAO/NASA ADS) has been developing a versioning scheme based on the Semantic Versioning standards for the Unified Astronomy Thesaurus. The existing versions found on GitHub have been renamed to follow the new scheme, and this versioning system will be used moving forward. A defined versioning system will allow us to post useful patch notes, to describe the kinds of changes that have been made from one update to the next. Once finalized, the versioning documentation will be made available. Additionally, we are examining the process of providing deltas (a file containing only the changes from one version to the next) as part of the update cycle. A persistent issue for updating and managing the UAT over the years has been keeping track of suggestions, contribution, and the decisions regarding them. Our first temporary solution consisted of emails sent directly to me that I filed away into a folder until I was able to act on them. Unfortunately, this system was equivalent to a black hole. Information goes in, but it’s hard to tell what, if anything, is coming back out. At a recent Steering Committee meeting, the Issues feature on GitHub was suggested as a way to manage and track the various suggestions. GitHub also has the added benefit of being an open system; anyone can see the current suggestions under discussion and create an account to make a contribution. A few weeks ago I began the work on transferring comments to the UAT Issues tracker, and I would welcome anyone with a suggestion or idea for the UAT to add it to the list. More documentation detailing how we will be using the Issue tracker will be forthcoming. Over the last year, the Sorting Tool was developed by Sarah Weissman (STScI) and myself as a way to give our users a visual overview of the UAT and make suggestions directly in the hierarchy. Although this is a very powerful tool, currently the system submits its feedback as an email directly to me, which I plan to duplicate as an Issue on GitHub. Pushing feedback from the Sorting Tool directly into the Issue tracker is being examined. Updates have been made across the UAT website, focused mainly on cleaning up the existing content and tidying up the navigational menus. With the addition of the ANDS vocabulary server, I’ve removed the old hierarchical and alphabetical browsers, the UAT Explorer, and the UAT dendrogram view. These tools were difficult to maintain, requiring manual creation of files and uploads to the website. The new vocabulary server maintained by ANDS replaces most of those functionalities. The Governance page has been updated to reflect the Steering Committee, and the Contribute pages now direct users to GitHub and the Sorting Tool. 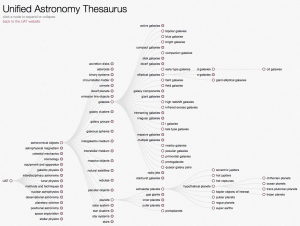 Unified Astronomy Thesaurus v.1 is here! Today I am releasing version one of the Unified Astronomy Thesaurus (UAT v.1). The UAT has been completely overhauled; restructured into new top level categories and re-organized throughout. There have been many major revisions to bring it more inline with the way astronomers and astrophysicists study the universe. I want to thank Sarah Weissman, Josh Peek, Kayleigh Bohemier, Dianne Dietrich, Jane Holmquist, Barbara Kern, and especially Jill Lagerstrom for all of the work each of you put into revising and updating the thesaurus. I also want to thank the many researches and scientists who lent their expertise to this project. Because of all of you, every term in the UAT was looked at, revised, edited, tweaked, or moved. Version 1 of the Unified Astronomy Thesaurus has 1834 terms, 11 top level categories, a depth of 10 terms, and 319 ‘related term’ links. For comparison, the beta version of the UAT had 1920 terms, 15 top level categories, a depth of 15 terms, and 224 ‘related term’ links. In addition to the major restructuring of the UATs top level categories and overall organizational structure, 321 terms were removed, 236 new terms were added, and 95 new ‘related term’ links were added. All thesaurus views on this website have been updated to UAT v.1. The beta version can still be accessed via the archived files on GitHub and through the UAT Explorer (choose “beta” from the version drop down menu). Of course, the work on this project is not finished! The goal, in fact, is that it will never been finished. There are still areas in the UAT that could be further improved and new terms that could be added. We’re always interested in feedback on the UAT, and we have some long term ideas for an expansion that I am very excited about. In the meantime, I will be presenting the Unified Astronomy Thesaurus at the upcoming AAS meeting in Kissimmie, FL on Wednesday January 6th and 12noon. Hope to see you there! I just realized it had been a while since my last update! I’ve been working on the UAT behind the scenes quite a bit lately, though most of it has not been visible so I thought it would be a good time to write another update email. We’re nearly ready to launch VocBench: After looking at various tools, we landed on VocBench, an open source platform for managing and editing controlled vocabularies. We’ve spent the last few months getting it ready to go, and we are almost ready to make it public. This platform will allow users to suggest edits and updates to the UAT, which are then assigned to our team of editors for review, and suggestions that are accepted will be incorporated into a future release. Recent updates to the UAT website: I spent some time re-organizing the website to make visible some items that have previously been buried. For example, now you will see the Contribute button right in the menu bar! For now this button takes you to our contribution form, but once VocBench it launched, it will go there instead. Also, the download section is no longer hidden under the Thesaurus button. From there you can download the current RDF file as well as a new flat CSV file. I’ve also included a link to the UAT GitHub repository, where I’ve been hard at work creating scripts to turn the RDF/SKOS file into the website browsers. Posters and papers: Alberto Accomazzi, et al, wrote a paper about the UAT project, following a poster he presented at the ADASS XXIII conference. Currently the paper can be found in arXiv, but it will also be published in an upcoming volume of the ASP Conference Proceedings. 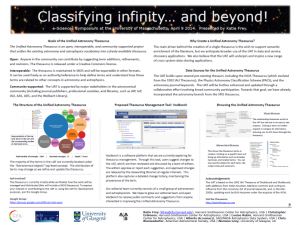 Another poster on the Unified Astronomy Thesaurus was presented in June at the Libraries and Information Services in Astronomy conference, with an upcoming paper also scheduled to be published in a future volume of the ASP Conference Proceedings. We’re still looking for volunteers to help oversee various branches of the UAT! If you’re interested in becoming an editor, please let me know. The Unified Astronomy Thesaurus (UAT) is an open, interoperable, and community-supported thesaurus of astronomical and astrophysical concepts and their relationships. It unifies existing divergent and isolated astronomy and astrophysics vocabularies into a single high-quality, freely-available online thesaurus available to publishers, authors, and everyone else an interest in classifying astronomical concepts. 3) a dendrogram, or tree graph, which visually lays out the UAT and lets you expand and collapse terms to to explore the relationships between words. Additionally, the UAT is available for download in several formats, including RDF and CSV. Please note, however, that since the UAT is still in beta, we expect many changes in the content of the thesaurus before our official version one release. A second step forward that we have taken has been to reach out to other groups that work with thesauri, specifically AgroVoc and EuroVoc. Both use an open source management platform called VocBench (developed by FAO specifically for ArgroVoc) to maintain and edit their thesauri. The developers of VocBench have aided our group in setting up an in-house trial to test the solution for the development and maintenance of the UAT. This platform allows multiple users to log in and suggest changes to the UAT, and it also does an excellent job of catching a detailed change history, maintaining the provenance of the term, and tracking where suggestions are originating from. Suggestions made by users of the UAT will be accepted or rejected by our subject specialist editors, then the stewarding librarian will release these changes at regular intervals in versioned batches. Currently, we are working with a small group of astronomers and astrophysicists who had previously expressed interest in becoming part of the editor team. We will be giving them access to the UAT on the VocBench platform, which will allow them to test the interface and begin making suggestions to improve the UAT. Assuming all goes well, we hope to allow public access to VocBench in 2014. In the meantime, if you wish to view the UAT, you may peruse online browsers at the UAT website or download thesaurus files. Suggestions for the UAT may also be made using the new “Contribute Form” on the website. Comments submitted in this manner will be forwarded to our team of editors for further discussion and inclusion in VocBench. In an ongoing effort to make the Unified Astronomy Thesaurus more open and accessible, we’ve added multiple download options. The Executive Summary of the Unified Astronomy Thesaurus. The most current version of the UAT in SKOS and Excel format can be found at the UAT Github repository. An incomplete comparison of the UAT with SPIE and IVOAT in an Excel spreadsheet. Browse the Unified Astronomy Thesaurus! Over the last week I’ve added the ability to view the Unified Astronomy Thesaurus from the website. To start browsing through the terms, mouse over the Thesaurus button in the menu above. an alphabetical view – navigate to specific terms and learn more about them. We’re still working to improve these browsing methods and add additional functionality to the website.